Motorola RAZR HD, RAZR M launching in October? 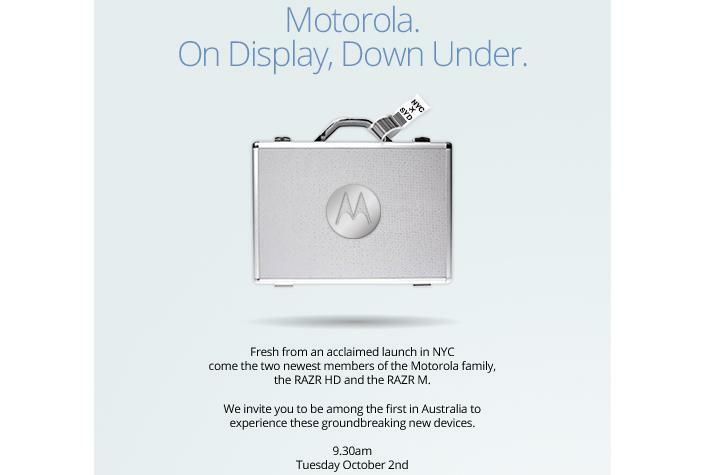 Motorola's invite to the Australian launch of the RAZR HD and RAZR M 4G smartphones. 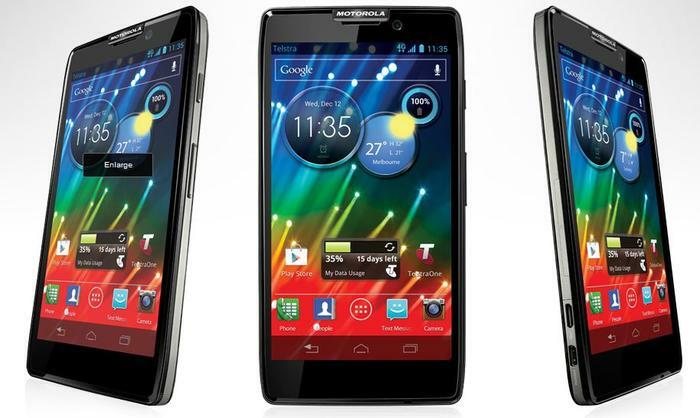 Motorola's latest 4G Android smartphones, the RAZR HD and the RAZR M, are expected to officially go on sale in Australia next month, after the company sent a launch invitation to Australian technology media. Motorola had previously announced that the RAZR HD and the RAZR M would exclusively be sold through Telstra in Australia, but did not provide a firm availability date beyond Q4. However, that launch date appears to be closer than initially expected as the launch event is scheduled for the morning of Tuesday 2 October, in Sydney. The invitation says attendees will "be among the first in Australia to experience these groundbreaking new devices". Both the RAZR HD and RAZR M are LTE smartphones that will work on Telstra's 1800MHz 4G network. The 4G phones were officially unveiled at a global launch event in New York earlier this month. Both models have similar internal specifications, but slightly differ in design and screen size. The RAZR HD has a large 4.7in screen with a 720p HD resolution of 1280x720, while the smaller RAZR M has a 4.3in screen. Motorola says it pushed the screen as close as possible to the edge of the phones in order to maximise the screen without compromising on physical size. The pending launch of the Motorola RAZR HD and the RAZR M comes at a time when 4G smartphones are becoming more common Down Under. Apple's 4G-capable iPhone 5 goes on sale later this week, while a new, 4G-capable version of Samsung's popular Galaxy S III smartphone is available through Optus and Virgin Mobile now and will go on sale next month through Telstra. Meanwhile, Optus has recently launched its 4G network in Sydney, Melbourne Perth and Newcastle, while Telstra announced that it is currently expanding its 4G mobile network coverage, promising to cover 66 per cent of the Australian population by mid-2013. A promotional video of the Motorola RAZR HD and RAZR M can be viewed below.